This story is nothing like I’ve read from Ms. Reisz before. NOTHING. In fact, this story has to be one the most insane stories I have ever read. I went in knowing nothing. 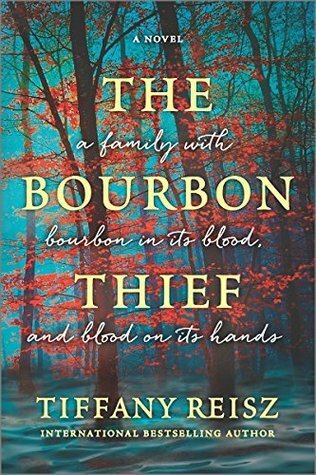 No spoilers or anything, just a vague idea that it’s about thievery and bourbon. That’s it. But when I finished I sat back and wish I took Dramamine for all the twists and turns this book had. A truly wild ride. When Cooper McQueen wakes up from a night with a beautiful stranger, it’s to discover he’s been robbed. The only item stolen—a million-dollar bottle of bourbon. The thief, a mysterious woman named Paris, claims the bottle is rightfully hers. After all, the label itself says it’s property of the Maddox family who owned and operated Red Thread Bourbon distillery since the last days of the Civil War until the company went out of business for reasons no one knows… No one except Paris. You must go into this story blind to truly appreciate the way the story unwinds itself on the pages. Deception, lies and revenge are the main themes of this tale. And one seriously messed up family. I won’t reveal spoilers, but I will say that you’ll never see the end coming. While some parts in this story will make you squirm, if you just take a deep breath, you’ll be fine. To be honest, I held off reading this because I wasn’t sure if I was going to like this more, or even as much, as her Original Sinners series. That series is bananas. But I am so glad I took a chance. Tiffany has a writing style that is so addicting, you can’t help but be sucked in. You won’t be disappointed in anything you read from her.